Music and sound effects play a significant role in giving a game a character of its own. It is absolutely essential to have a great background score and SFX in order to make users an addict of your game. 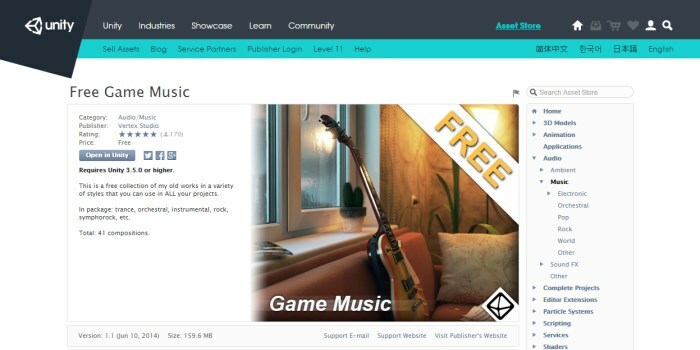 And good thing is that there are quite many sites that offer repositories of free background music, music loops and sound effects which can be used for developing commercial games. In this post, we bring to you many sound effect sources that we believe will help you in getting the kind of audio you are looking for your game. Some of these sites offer royalty free sound effects that you can download and use in commercial games for free. While some require you to give attribution to the artist. Always make sure you read the terms and conditions regarding their usage before downloading music tracks or sound effects from these sites. The sites listed below offer audio files in different formats including MP3, OGG, and uncompressed WAV. If you are planning to use MP3 files in your game, you may want to read our earlier post on MP3 licensing in games. 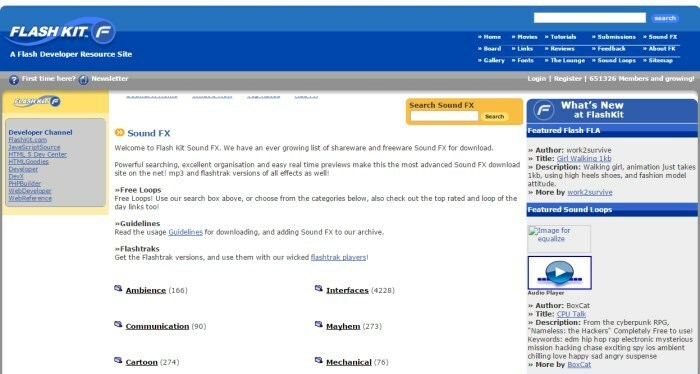 Freesound has a huge collection of sound effects, loopable audio snippets, and bleeps released under Creative Commons licenses. They support 4 file formats – .mp3, .flac or .fla, .ogg and .aiff/.wav. You can browse their collection by licenses, tags (suspense, terror, etc.) and file types, they also have featured sections for most downloaded sounds and latest sounds. If you like a particular sound effect, you can also browse sounds similar to it. 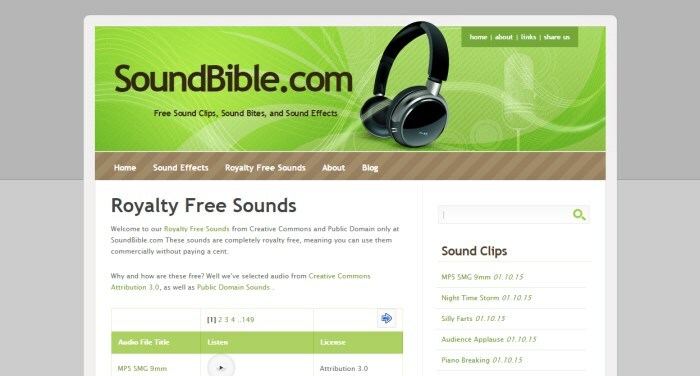 SoundBible offers royalty free sound effects that you can use commercially for free. Some of these sound clips may require you to provide attribution. These sound clips are available for download in either .wav or .mp3 format. You can easily browse these sounds by their tags. Some of the popular sound effects are, fight sounds, machine sounds, and laugh sounds. 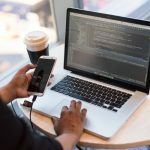 If you are a game developer, chances are that you are using Unity game engine and are familiar with its asset store. 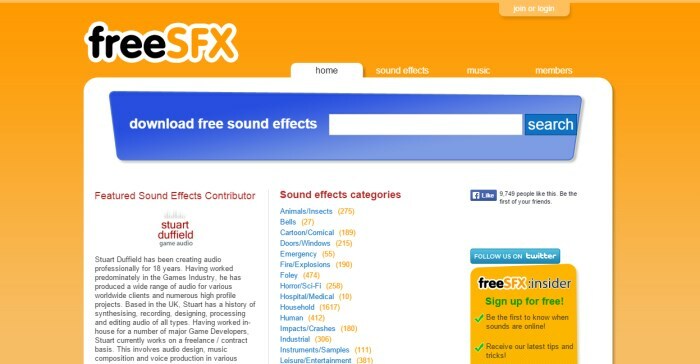 Unity asset store has a collection of free sound FX, music and ambient sounds. It also has a section of top free audio files. These free sounds can be downloaded within Unity only which itself is free for developing commercial games as well. Flash Kit has an archive of royalty free sound effects and sound loops for download. You can either keyword search these sounds or browse them by categories like ambience, nature sounds, and cartoony sounds. 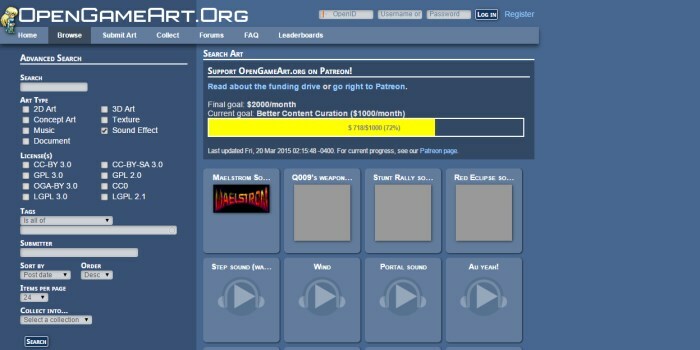 OpenGameArt is a repository of 2D and 3D game art, textures, music and sound effects for game development. It has a huge library of music and sound effects contributed by different artists. These audio files can be easily searched and filtered by licenses and tags. 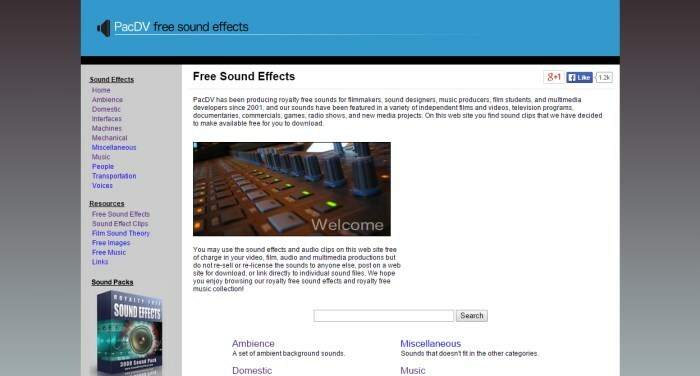 PacDV has a collection of royalty free sound effects and royalty free music. 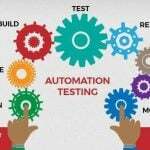 The sound effects are grouped under different categories like mechanical sound effects, ambient background sounds, human sound effects and music tracks. 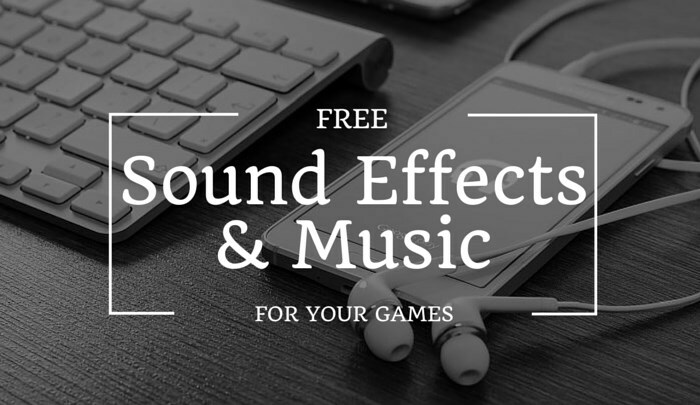 You can use the sound effects and audio clips free of charge in your multimedia productions and games. 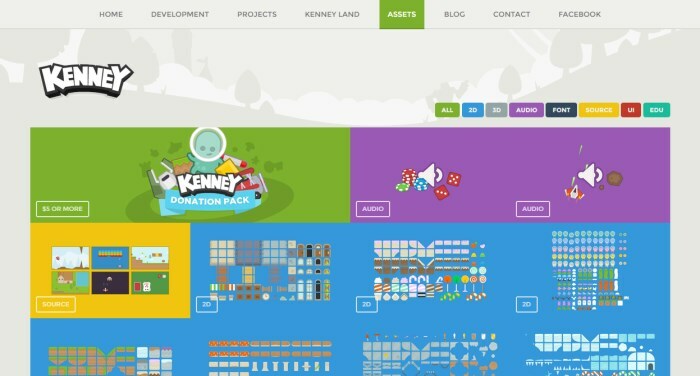 Kenney, a game designer, and developer, provides CC Zero licensed game resources on his site. These game assets also include audio files that are available in different packs like RPG audio, casino audio, music jingles and UI audio. I used one of his music jingles in my cross-platform game Spooky Planet. 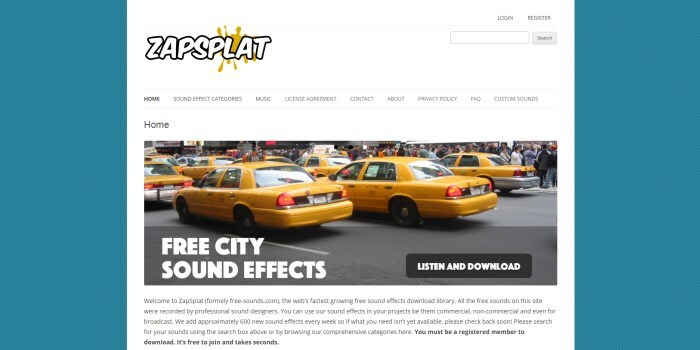 ZapSplat provides free sound effects that can be used in any non-commercial, commercial and broadcast production in exchange of attribution. You can browse their sound library by categories like animals, bells, cartoons, explosion, and household or you can keyword search according to your requirement. 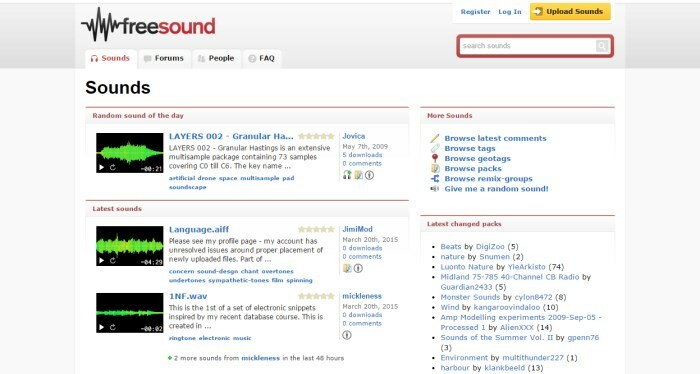 You need to register for a free account to download sounds from their site. 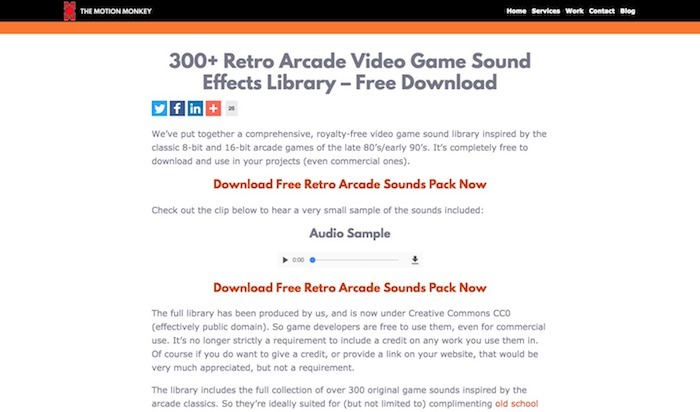 The Motion Monkey have a library of around 300+ retro sound effects inspired by the classic 8-bit and 16-bit arcade video games of the late 80’s and early 90’s that you can download for free in a single pack. 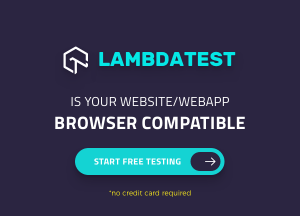 The download contains sounds in uncompressed 24-bit wav, ogg and m4a audio formats that can be used in popular game development platforms/engines including HTML5, Unity and Gamemaker Studio. Some of the sound types included in the pack are explosions, weapons, impacts, character sounds, vehicles, arcade style game sounds (game over, power up, bonus) and UI sounds. These retro sound effects are available for free download and use under Creative Commons CC0 (public domain) license. 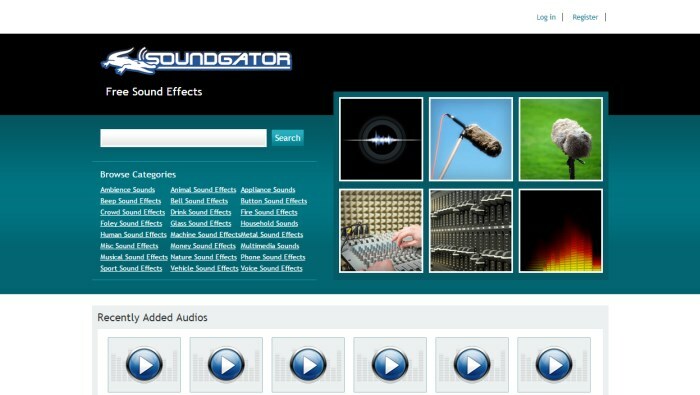 SoundGator offers free sound effects that you can download and use for your videos, presentations, apps and games. 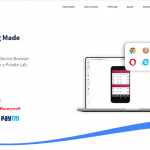 Sounds are put together under different categories like beep sound effects, vehicle sound effects, sport sound effects and many more for easy browsing. 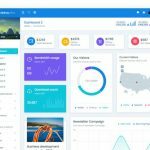 freeSFX provides free sound effects for use in commercial and non-commercial projects including those that will be broadcast. In exchange attribution is needed. It has a library of high definition sound effects and music tracks available under many different categories including sounds of animals/insects, fire & explosions and Sci-Fi sounds. 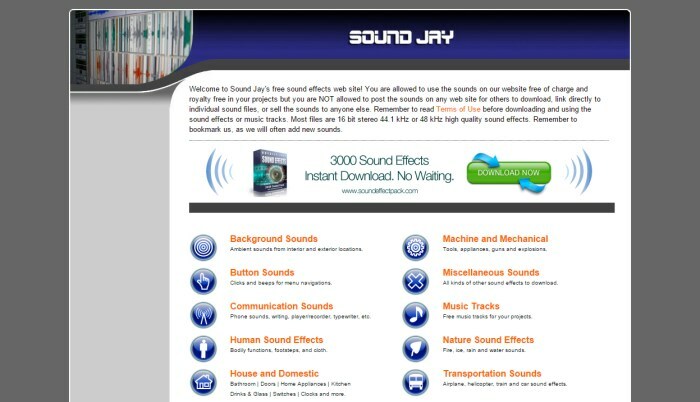 Sound Jay offers music and soundtracks that you can use in your games free of charge. Sound effects are available as both uncompressed .wav and .mp3 files. They are placed under different categories like button sounds and background sounds for easy browsing. 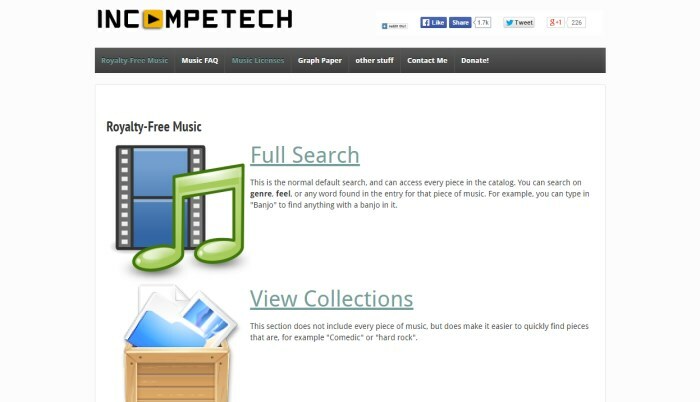 Incompetech has royalty free music tracks available under Creative Commons attribution license. You can search its music library by genre and feel. SoundImage.org provides 600+ tracks of free music and soundscapes that are free for developers to use. 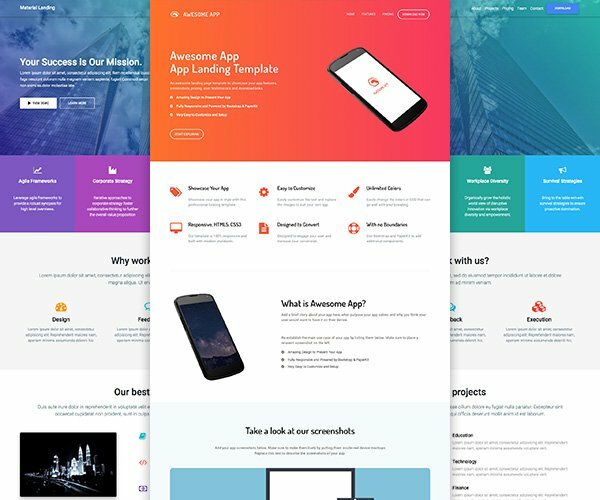 These sound effects are original work of Eric Matyas and are available in many popular genres such as Action, Fantasy, Classical, Dark, Drama, Horror, Sports, Urban, Techno, and Sci-Fi. All these music on SoundImage are free to use for both non-commercial projects as well as commercial projects. An attribution is required when you use them in your game development project. 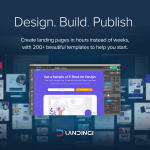 We will be adding more websites that offer free sounds and keep this list growing. If you want to make a suggestion that we can add to this list, you are welcome to share it with us and our readers in the comments below. And do remember to share this post with your friends and followers, we would greatly appreciate it. 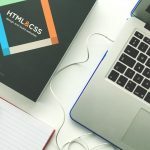 You may want to read our post on leaderboard service providers for integrating leaderboards in your games and have a look at these open source HTML5 games for some inspiration. We regularly share many free resources, fonts, icons and textures that can be of help for your game design. 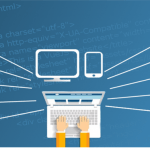 Why Do You Need Responsive Design for Your Website? I was looking for free music for my game and I am glad I found this. Thanks for putting this up, very useful. ourmusicbox.com has a lot of music too!